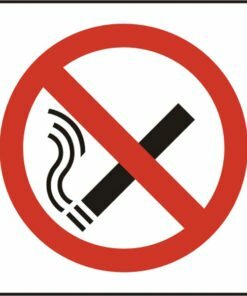 A collection of no smoking signs to be used in and around the workplace, public buildings and smoke free vehicles such as taxis and buses. Part of our range of quality safety signs. 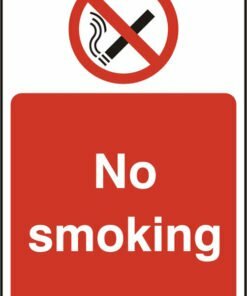 Our no smoking signs are available as rigid PVC or self adhesive vinyl signs. All signage comes in a pack of five. As a company, it is your duty to display no smoking signage in any areas around your premises that are not a designated smoking area. 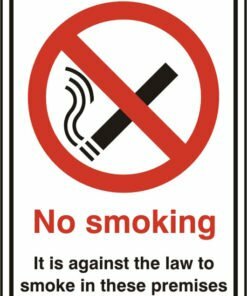 You can also indicate the smoking areas where it is permitted for people to smoke using our signage. As smoking has been banned in most public places in the UK, no smoking signage is a must in ensuring a healthier and cleaner workplace for all. Need any help with your online order? Then call us on 0330 0885 675 and we’ll be very happy to assist you with your purchase.